We’ve all been there, you’ve got a pain in your leg or a weird swollen eye, you put your symptoms into Google and suddenly you’re terrified you’ve got some kind of crazy flesh eating illness and only minutes to live. Well, although that may be a pretty extreme case, Google is on a mission to make self diagnosis online as easy and accurate as possible. In the past if you Googled certain symptoms you’d find a lot of Yahoo! 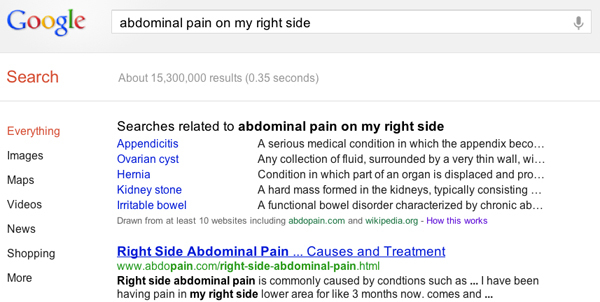 Answer pages, some WebMD pages and a load of forums appear near the top of your search results. This led Google to revisit the way it displays websites when you input anything about the symptoms or illnesses you or a loved one are experiencing. You can see above that the list of possible conditions then appears before any other search results. Although none of these websites or conditions are necessarily written or determined by medical professionals (and we imagine some will still probably be a bit worrying), it’s interesting to see Google take this kind of online self diagnosis seriously and give users as much information as possible. However, at the end of the day Google may be VERY clever, but it’s no doctor.